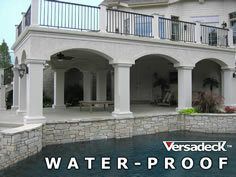 The Versadry™ Waterproof Decking Solution is Watertight and Versatile. Create dry usable storage space under your deck WITHOUT THE PUDDLES ABOVE and live on an aluminum deck that doesn't sound, feel or look like an aluminum deck thanks to our 60-80 mil thick coating. 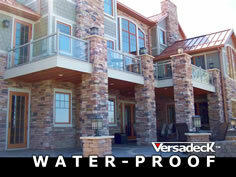 100% Watertight - built with gasket seals. 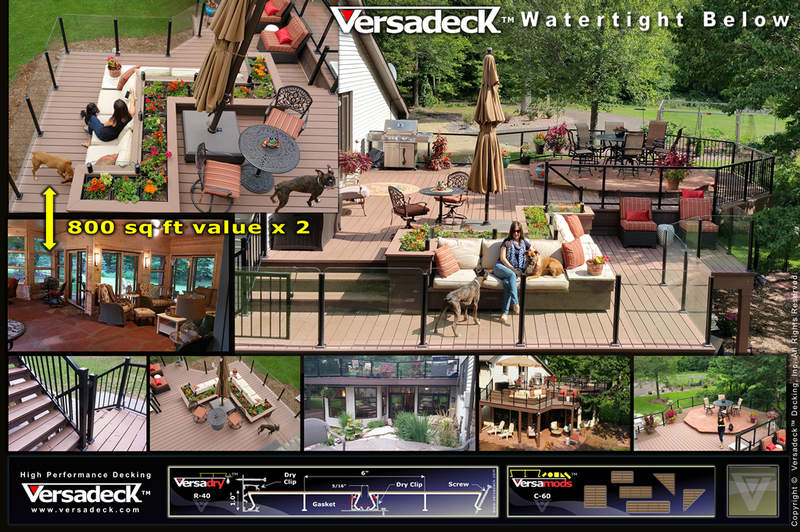 Versadry™ is unlike other waterproof decking systems that lock together creating a continuous seal at the top requiring water to flow off the deck edges. Although the majority of the water may run off during a heavy rain, much is left on the surface leaving large puddles that can take days to dry up. 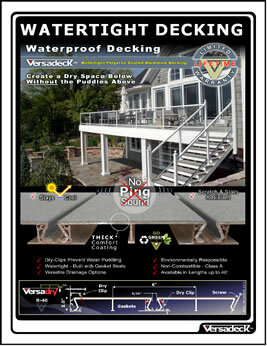 Versadry™ allows water to run into the Dry Clip channels first allowing the deck surface to drain and dry quickly. 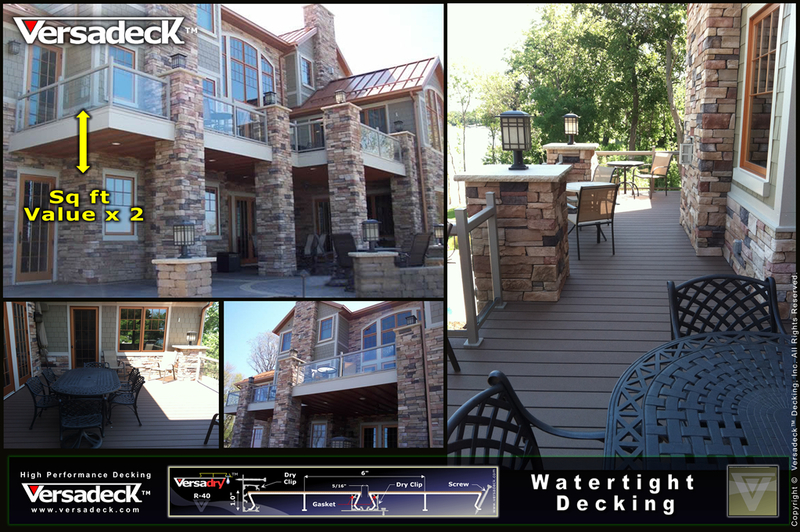 The water then flows through these channels and off the deck edge or into a gutter. 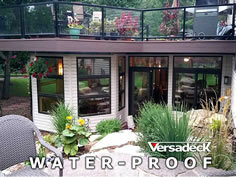 Versadry™ eliminates puddling and the need to squeegee water off your deck every time it rains. 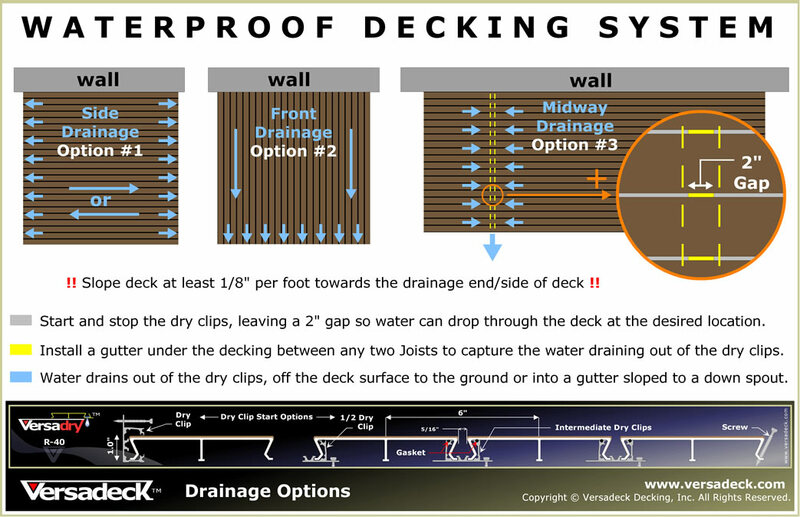 No need to squeegee means lower maintenance and a safer slip resistant deck solution with an under deck dry storage space below. 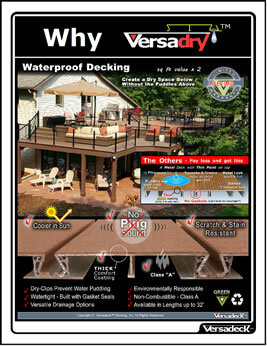 The Versadry™ two piece waterproof aluminum decking systems creates drainage and water flow options. 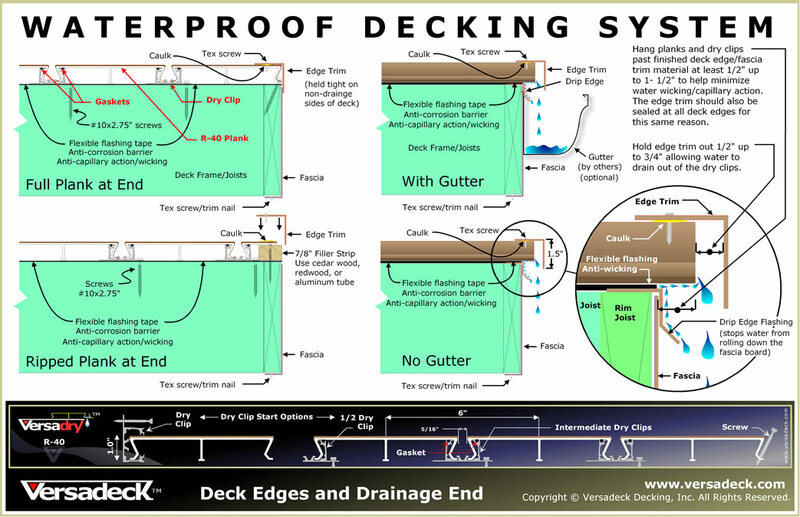 Rain water can be directed to flow to and drain off the edges of the deck or in a specific location in the middle of the deck into a midway gutter. 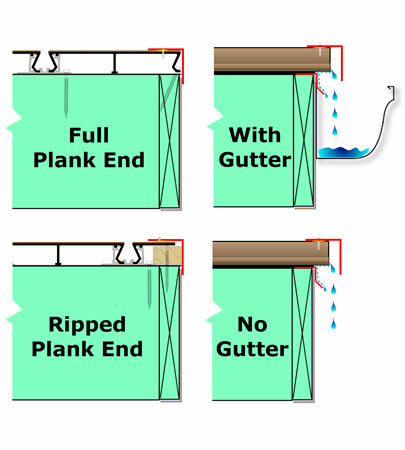 A midway gutter can be installed anywhere between two joists by simply stopping and starting the Dry Clip channels and leaving a two inch gap for the water to drop through. The water then drains into a gutter installed under the bottom of the decking running parallel between any two joists. You can also omit the Dry Clip altogether in an area where the deck doesn't need to be waterproof. These options can all be performed without splicing the planks. The result is a continuous consistent plank look from above, with a dry space storage area below with the water flowing and draining at ideal locations. 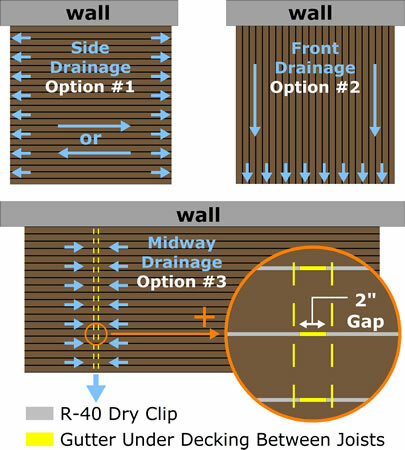 A Versadry™ Dry Clip is hooked onto the first plank and flipped into a vertical position connecting it to the the first leg that will be up against the wall. Another Dry Clip channel is then connected to the other plank leg in the standard horizontal position. 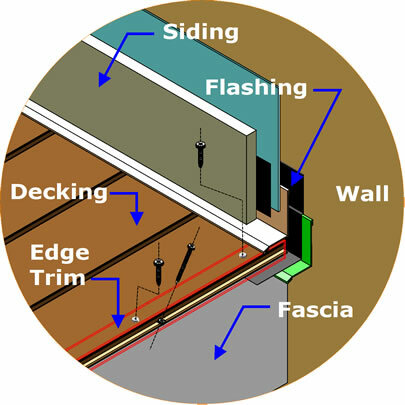 The top of the first vertical positioned Dry Clip is then screwed into the wall and covered with self-adhering rubber tape flashing, sealed and overlapped with siding. The horizontally positioned Dry Clip is then screwed down to the supporting structure (the next plank to install will connect here). The first plank is now installed and you are ready to install the second and all the intermediate planks. 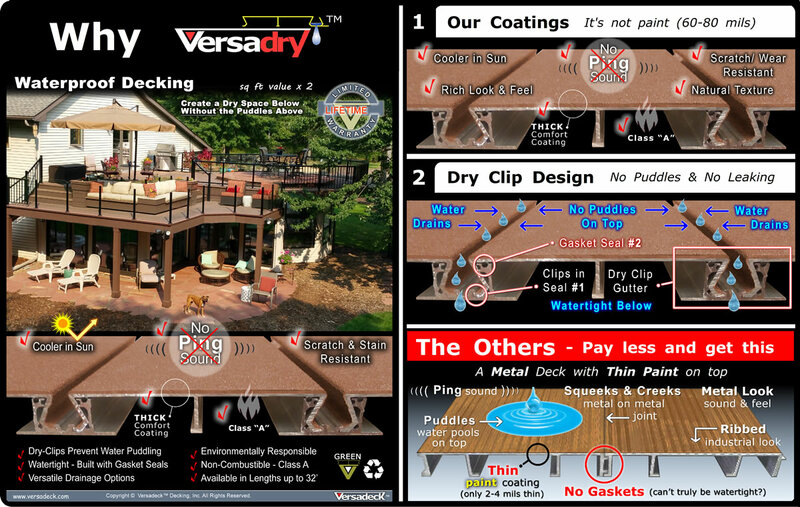 The Versadry™ Dry Clip extrusion creates a watertight gasket seal and fastens the decking to the supporting structure at the same time. 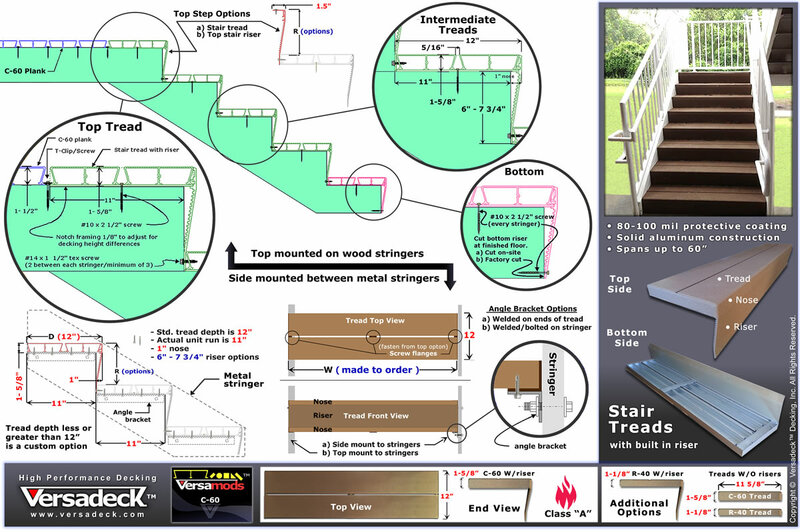 The first plank to install should be the one that connects to the building wall (see Waterproof Decking Attachment to a Wall). The second plank is then hooked and locked into the previously installed plank's Dry Clip. A Dry Clip is then connected to the other plank leg and fastened to the supporting structure. Repeat this step on all intermediate planks. Once all intermediate planks are installed, the final finish plank is ready to be installed. The final plank to be installed may fit perfectly without it needing to be rip cut to fit. In this case a screw can be installed through the outer plank leg fastening it to the supporting structure. If the last plank needs to be rip cut to line up with the outer deck rim, a filler may be needed to support the cut plank end. After installing the filler block, cover the cut end of the plank with edge trim to hide the cut and filler for a clean finished look. 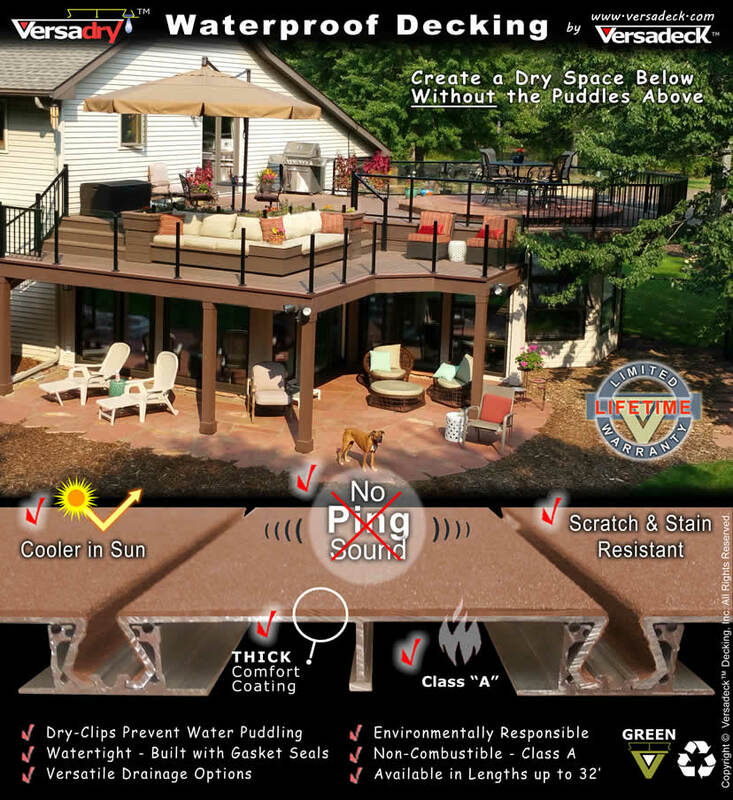 Compared to most wood and composite decking materials, Versadry™ aluminum decking is 2 to 3 times lighter, yet 2 to 3 times stronger. 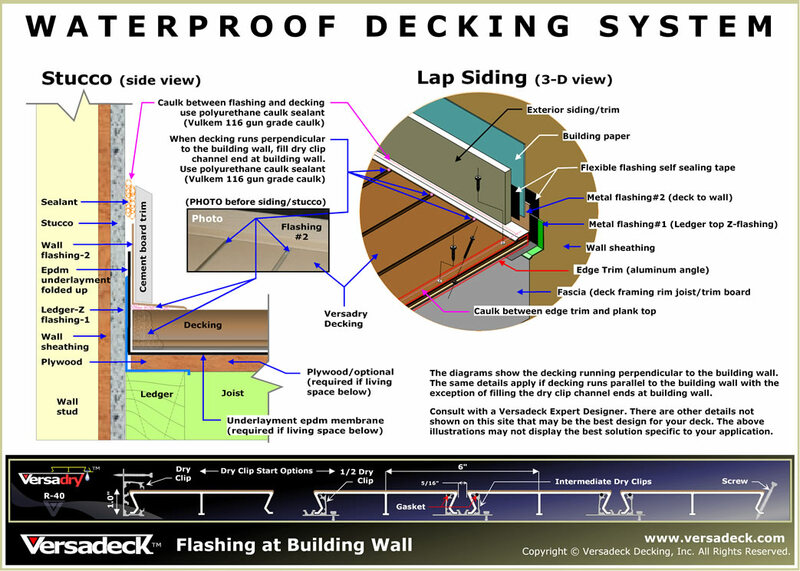 There is less structure needed to support the decking saving time and money. Heavy back breaking labor is dramatically minimized making installation easier, safer and more enjoyable. 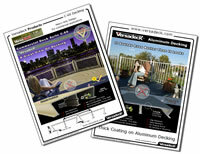 Versadry™ can be cut with the same saws used to cut wood. There is no need for special saws with metal cutting blades. 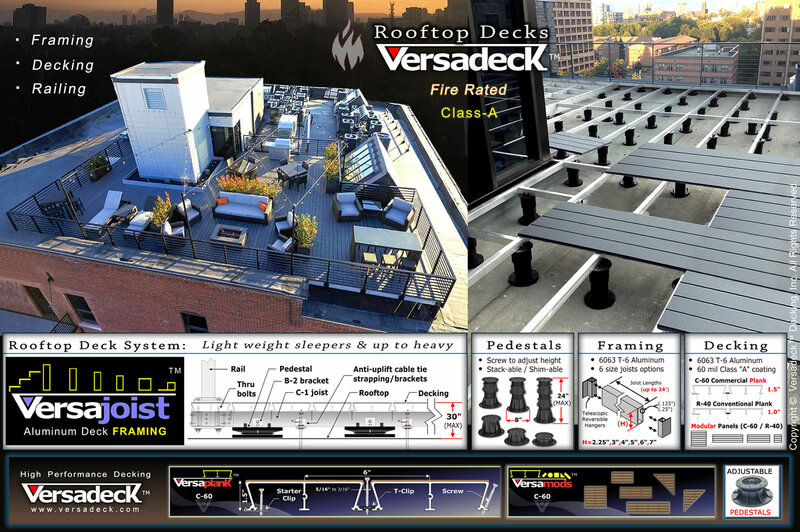 Versadry™ aluminum decking is always straight and consistent in width unlike most wood and many composite products. 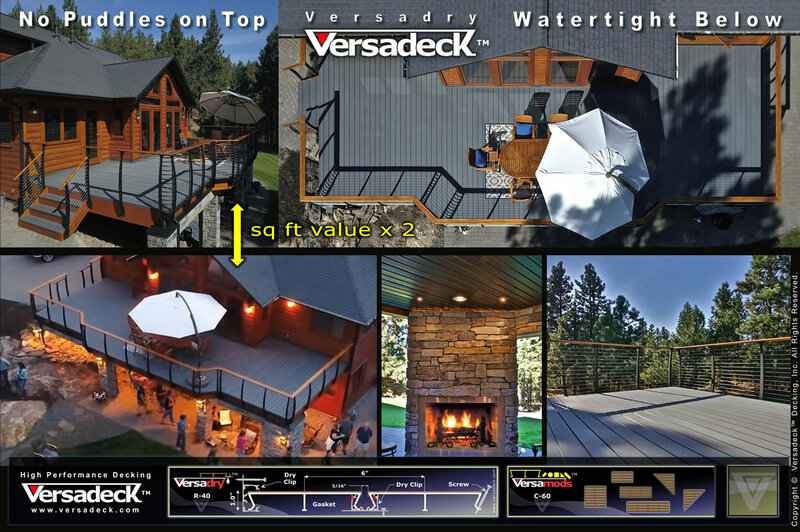 Versadry™ decking won't twist, shrink or warp over time when installed on a properly built supporting structure. The size and colors are always uniform. 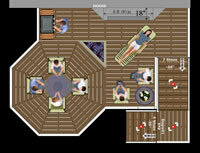 There is no need to pick and sort to strategically place them to hide inconsistencies and blemishes as with most wood and composite decking products. 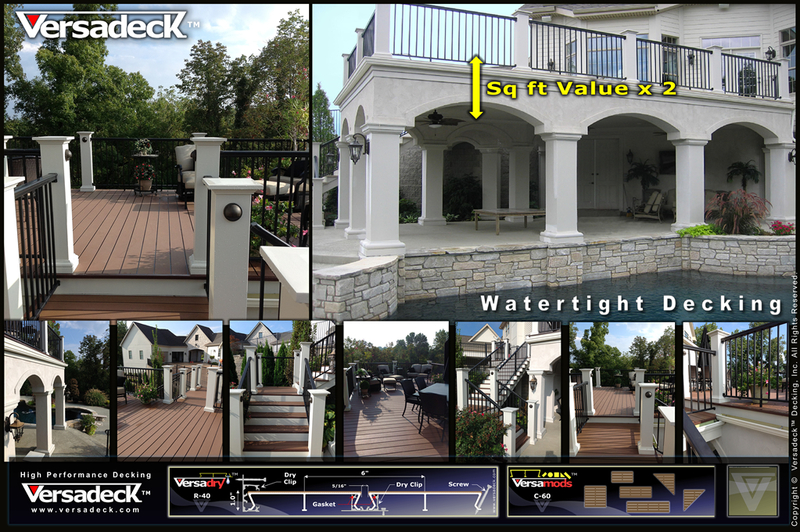 The final installed look is virtually flawless resulting in a pleasing, quality look and feel.